A new ground displacement map shows the dramatic degree to which the Italian landscape moved during the October 30 earthquake, including an unfortunate mountain village that heaved over two feet. This past Sunday, a 6.5 magnitude earthquake rocked central Italy—the strongest to strike the country in 36 years. The quake was the third to strike the region in four days, causing serious damage to houses and other structures. The entire village of Arquata del Tronto was destroyed, as well as the historic Basilica of Saint Benedict in Norcia. In addition to being the strongest of the three quakes, the October 30th quake was also the shallowest, which is unfortunate for those living on the surface. 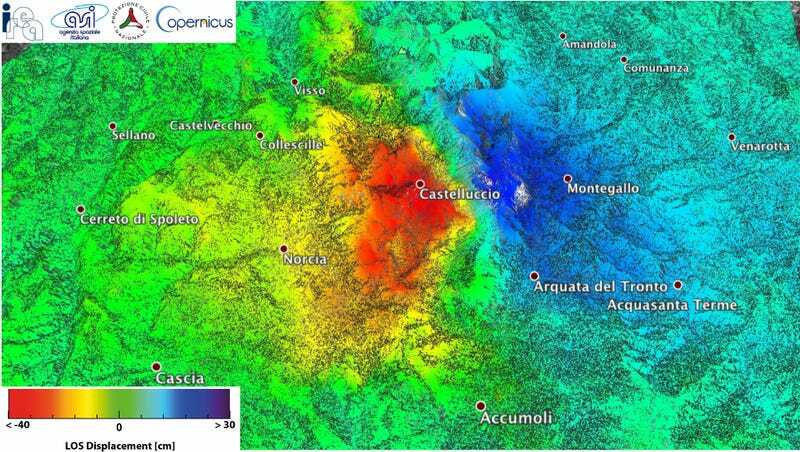 Scientists from Italy’s Institute for Electromagnetic Sensing of the Environment recently combined radar images from two satellites to analyze ground displacements caused by the quake. The resulting map shows dramatic ground deformations in the landscape relative to the direction of the satellite’s observations. Unlike conventional earthquake maps that show an epicenter and seismic strength, ground displacement maps provide an alternate glimpse of a quake and how it actually reshapes the landscape.